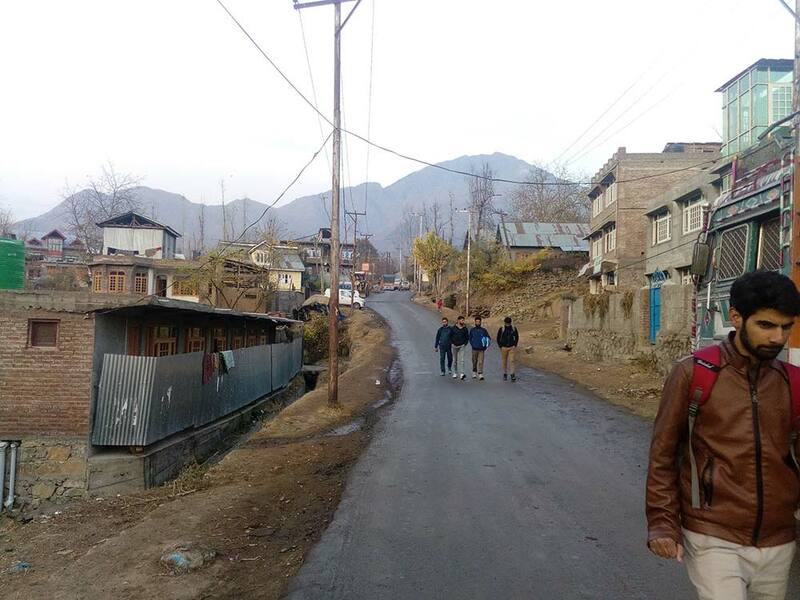 Students of IUST walking near their rented accommodation in Awantipora. In 2004, Abdul Rashid 45, a Bilal Colony resident in Islamabad, lost his right-hand fingers while working in his band saw, his only source of income for a family of five people. A year later, Rashid started a poultry unit in his courtyard. Soon, he sold out his livestock. “Poultry farm needs more manpower which I cannot hire Rashid said. For the first time, he felt genuinely jobless. in 2006, when Islamic University of Science and Technology (IUST) was established at Awantipore, a historic town with roots in Hindu era, Rashid saw a ray of hope. He put in his savings and constructed a shop on main link road that leads to the university. As the campus started swarming with the boys and girls, Rashid’s shop became the only address for all the stationery items. Soon he added fruits and some eatables to his inventory. Now, Rashid’s middle son Abid Ahmed, 20, pursuing his commerce graduation from Government Degree College, Islamabad, assists his father after his college hours. Abid’s two sisters are also enrolled in different educational institutions and their studies are funded from the earnings from the stationary shop. The spot that houses the Islamic University was an isolated patch of land where people normally avoided to go during evenings. Barren by nature, the foot-hill field was used for grazing cattle or playing cricket. Now it is the only posh address in the historic town that Avantivarman is believed to have built somewhere around in 870. In the last more than a decade, the University is a major change-maker in the socio-economic profile of the town. As scores have found smaller jobs, the opportunity that the vast campus has offered is adding to the town’s earnings. Manzoor Ahmed Badre 40, a tipper driver lives in town’s Kumar Mohalla, in a cluster of houses outside University. He is the main earner for a family of six members. Living in the 4-room, single storey house, Manzoor decided to give one of the rooms on rent to a student. The University has more than 4000 students, 2500 of them boys, on its rolls who are being taught by almost 200 teachers. It has a mixed fleet of buses of 44 bus, some belonging to private owners, driving 1582 students, mostly females, to the campus from various locations including Srinagar, a process still going on. In the second stage, it hired certain buildings an converted them into hostels. Now it has the capacity of accommodating 500 students in its four hostels, three for 270 boys and one for 230 girl students. The university has only the girls’ hostel of its own, all others are rented spaces. Given the demand for more accommodation, the people started offering part of their homes to the students, in certain cases to the faculty and other staffers as well. It has emerged into a small big economy for the residents, especially those surrounding the university. Mehmooda, the tipper driver’s wife, says her family had a hand-to-mouth income. But the rent that their one-room fetches has given them a bit of relaxation. A few years later, the family has now decided to construct a second floor and the entire level will be rented to the students. This is how an additional Rs 2000, monthly income has changed a family. Kumar Mohalla residents were the main beneficiaries of the University because they are closer to the campus. This Mohalla is an unofficial hostel as every family houses students, some as paying guest and some as owning demarcated rented space with kitchens and baths attached. Now the talk in town is that if some item is not available in the main town, it exists on the shelves of small kiosk style shops in Kumar Mohalla. Though it takes barely a 2-minute walk from the main road to the Mohalla, locals said the residents now hire auto-rickshaws to reach home! Abdul Gani Allie, 73, is one of the beneficiaries. In his two-storey house, three rooms are rented to students. Gani and his son Zahoor, 35, are peasants with modest income to manage seven family members. The incomes have gone down after Gani started remaining usually unwell. As the bills for his health issues appreciated, the rented rooms are the family’s saving grace. Ghulam Ahmed 50, a resident of Tral, was suggested by his nephew, a former student of IUST, to set up a bookstall outside the University. Ahmad was a private school teacher, usually earning Rs 3500, a month. He was unable to manage his family that also included his parents. He gave up teaching in 2010 and took on rent a shop in the main market. Land prices in Awantipore in general and the University belt, in particular, have gone massively up. When the University was announced, it was almost Rs 10,000, a kanal, but now land has “asking price”. The University has created opportunities in various sectors. Till 2013, Jan Mohammad, 28, a resident of Tangmarg, was a cook with a Srinagar restaurant. He was earning Rs 8000, a month. But this was too little for his family’s routine requirements. One day, he decided to quit his job. He hired a premises Awantipora and started his own restaurant, outside the University. Now, his income is about Rs 35000 a month and his restaurant is run by five people. Jan and his employee are happy. Impressed by the footfalls, they worked overtime to add more space. Then they added to their basket, various other foods. Amjid, 55, insists he should be referred as the Purple Uncle, the second name, he is famous with. He owns a restaurant; the Purple Restaurant next to Jan’s property. He was a contractor who invested in this eatery in 2008, perhaps the first major restaurant. “I can’t tell you exactly but I earn a lot comparing to what I used to earn earlier,” said, the Purple Uncle. His three sons study outside Kashmir and all their studies are funded by this restaurant.